What could make the wattles under your chin quiver more than the proud pose of a Common Wombat (Vombatus ursinus)? Unfortunately the most common time we get to see a wombat, particularly in our area, is when it is lying dead on the side of the road with all four legs in the air. 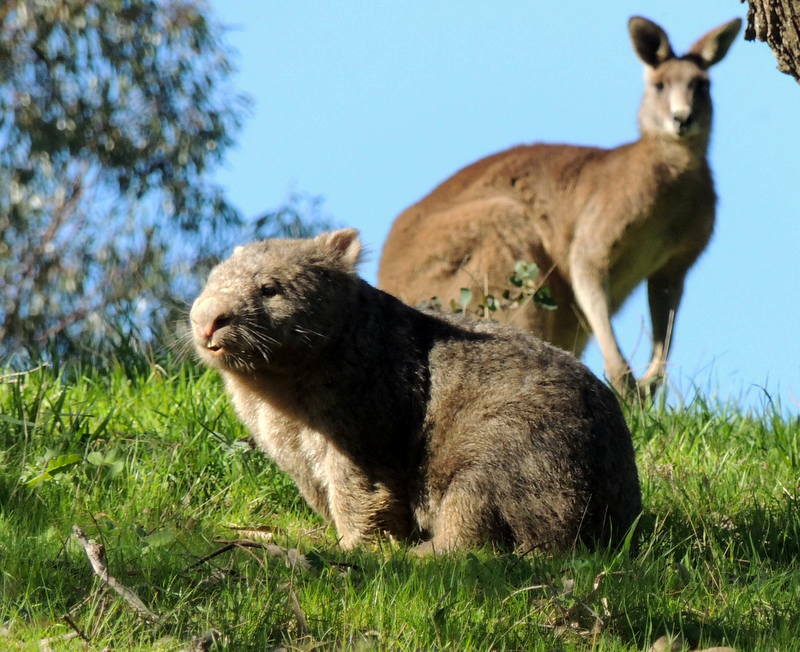 And if you do get to see one during the day it is usually suffering from the tick-borne disease, wombat mange, and very often is so ill it needs to be put down. It was therefore a rare treat to see this large healthy specimen out and about during daylight. There was a strong southerly wind blowing towards me, which probably explains how I managed to get so close to both the wombat and the Eastern Grey Kangaroo (Macropodus giganteus) before they could smell or hear that I was there. Common Wombats have very powerful front legs and large claws for digging burrows, an amazing feat given the rocky nature of where I live. The burrow opening of this particular individual is just shy of half a metre high. In the next bushfire it is going to be my place of refuge. This was not taken on Australia Day (note the green grass!) but just looking at it makes me want to yell, “Oi, oi, oi”.